According to OSHA, nearly 3,000 American workers were cited last year for not taking the proper safety measures required in order to protect themselves and their colleagues from exposure to hazardous energy. In 2015, 66 workers died from exposure to electricity alone. In this course you will become familiar with Lockout Tagout, OSHA’s set of practices that safeguards workers from both the unexpected energization of equipment or the release of hazardous energy during service and maintenance of equipment. Learn the energy control procedures that could save your life. Understand when to lock out and when to tag out. 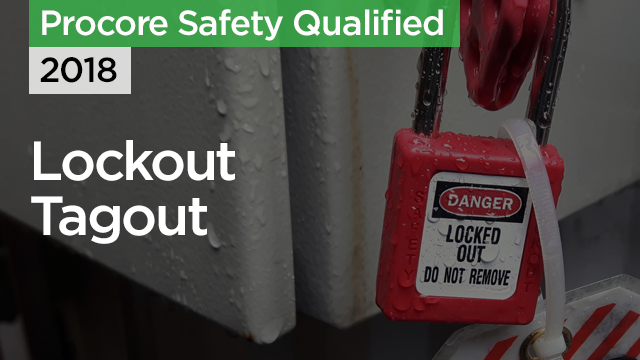 Learn how to distinguish between lockout/ tagout devices and determine the most appropriate device for a given piece of equipment. Become familiar with the processes of deenergizing, reenergizing, and inspecting equipment. Identify which members of your team have the authority to deenergize and reenergize equipment. Congratulations! You've completed a Procore Safety Qualified Course!